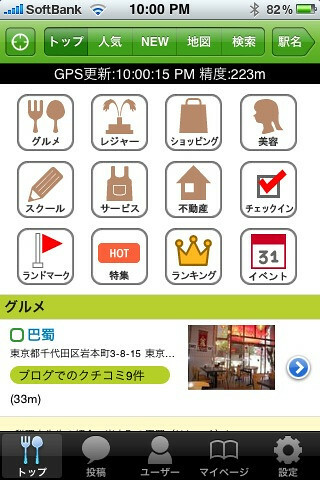 Japan based 30min Inc. has just updated their local navigation app with foursquare check-in features and twitter integration. Just over a month ago, the Foursquare phenomenon reached Japan and the growth has been explosive with weekly check-ins likely to soon hit six figures. It was only a matter of time before we started to see similar functionality from local Japanese applications. First was iButterfly. An Augmented reality game from Dentsu, offering twitter integration a coupons for catching location tagged virtual butterflies. I am more interested however in the response to this new update from 30min, a popular local assistant app. The concept behind 30min is things you can do within 30 minutes of your current location. This service offers restaurant listings, reviews, and photographs, as well as local services and businesses, attractions and events. This new update adds a check-in function similar to foursquare and twitter interaction so your followers can track your mealtime check-ins. You will be able to look back at your previous activities log and track check-ins of other users by location. Particularly in dense cities like Tokyo, these social based recommendation systems are gaining popularity as population of information can outpace more tradition forms of advertisement. It should be interesting to see if other services and applications will turn this into a trend of geo-location based social applications. 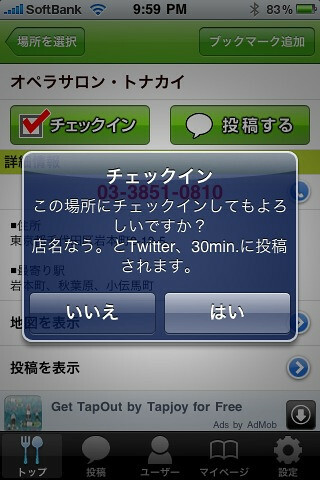 30min is an iPhone application and you can download it for free from this link. Unfortunately it appears to only be available on the Japan iTunes store and the application catalogs only information on locations in Japan. There is also an Android app, however these new features have not been added at this time. Where has all our Innovation gone? So Fast Company has released their list of most innovative companies in 2010. Hardly surprising is that Japan is hardly present on the list. In fact, only one Japanese company made the list. In fact, in recent years only two other Japanese companies have made this list; Nintendo (#21 in ’09, #10 in ’08) and Toyota (#39 in ’09, #48 in ’08). What’s most concerning is that this year’s Fast Retailing (The parent company that runs the clothing chain/brand Uni-Qlo) was certainly not brought in for technology. Meanwhile, mobile and technology companies littered the list, with Facebook, Amazon, Apple, Google, and Huawei taking the top five slots, well over half the list has strong ties to mobile technology, mobile services and media. So is Japan completely out of the loop? In a global sense, Japan is a non entity. Language being one of the major factors has kept a wall keeping Japanese customers and trends from participating with the global market. As much as has been commented on regarding the difficulties involved with foreign businesses operating on the ground in Japan, it’s equally difficult for Japanese companies to operate abroad. (Ironic that one of the only Japanese companies from Fast Company’s lists is experiencing that right now). But at the same time, we are seeing great innovation in Japan, particularly in mobile technology and services. This year’s #5 is Huawei, who has been doing gangbuster business in Japan’s new high speed mobile network as the largest manufacturer of 3G data cards and adapters. The whole 0yen netbook Emobile revolution has created a cheap laptops market that is the envy of both hardware manufacturers and data network carries across the globe. And what about Gree? The mobile based social network has seen enough growth in this down market to make the President Yoshikazu Tanaka the youngest billionaire in Asia. This game based social network has achieved domestic success that makes global SNS’s like facebook green with envy. Most of that growth taking place in just the last two years. So why the shun? The tech isolation of Japan has to end. For Japan and to benefit the rest of the world. Until we demystify and bring both Japanese companies and Japanese consumers into the global market, a place for this country in the most important technology field of the next decade is in doubt. This is my first post in out newly redesigned Mobile in Japan. It’s my hope that this website and community will be a strong positive influence on the communication between Japan and the rest of the world. Would be great if we can make a difference and maybe see more Japanese influence in the mobile market. Willcom, the fourth-larget mobile phone operator in Japan has just announced it’s filing for insolvency protection, in what looks like to be the biggest bankruptcy in Japan’s telecommunication industry’s history. Reuters reports that Willcom is JPY 206bn in debt has been in talks with its creditors to reschedule its debt payments since September 2009 but has failed to find any agreement outside the courts. If the current rumored agreement is reached, Willcom will be cut in two, its capital written off and will receive a fresh line of credit to revive its business, with the help of SoftBank, the third larget mobile operator in Japan. The operator was unable to expand its subscriber base in a saturated market: its market share fell more than 6% since its peak in July 2007, while SoftBank, for instance, gained more than 1.6m customers in the same period. While Willcom’s use of an older wireless technology, the Personal Handy-phone system (PHS) is obviously troublesome, its use of boosted cell stations had allowed it to partially solve the limited signal range it suffered in comparison of GSM. The introduction of a flat rate plan had also allowed it to maintain face in a fierce market. PHS services are mainly found in Asia, in particular China, Taiwan and Japan. The technology, which bores similarities with the DECT cordless telephony system, offers less cell range than GSM but also induces costs of only a fifth in deployment, which makes it attractive for developing countries. DoCoMo, not seeing any future in the technology, stopped enrolling new customers since 2005 and is slowly shutting it down. It seems China Telecom is not investing in it anymore either. Willcom, which started as a subsidiary of KDDI in 1994 specifically to deploy the PHS service before being bought out by Carlyle and Kyocera in 2004, has 4.4 million subscribers.Willcom said its current financial trouble wouldn’t interfere with service operations.